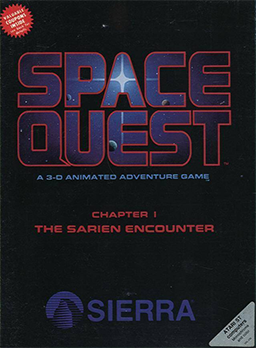 Space Quest: The Sarien Encounter was the first game in the Space Quest series. Roger Wilco is a lazy janitor who is the only person who survives when his ship is attacked by alien invaders known as the Sariens. It's now up to him to save his planet from extinction. The game was released in 1986 as a keyboard controlled graphical adventure game with a text parser using Sierra's AGI engine. In 1991, it was remade as a point-and-click adventure game with remade art in 256 colors using Sierra's SCI engine. Both the original AGI version and the SCI remake of Space Quest are now supported by ScummVM, a program designed to let 2D adventure games run on multiple platforms. With ScummVM, Space Quest now runs on modern versions of windows, as well as Linux, Mac OS X, and many consoles such as Dreamcast, Wii, PlayStation 2, and PlayStation Portable. For a complete list of platforms supported by ScummVM, see here.